Manchester United midfielder Bastian Schweinsteiger is unlikely to play for the club again this season, says manager Louis van Gaal. Schweinsteiger, 31, has endured an injury-interrupted first season at Old Trafford since joining on a three-year contract from Bayern Munich last July. The 2014 Germany World Cup winner tore a knee ligament while training for the March friendly against England. "I think, next season, he is prepared," van Gaal told MUTV. United have six Premier League games remaining while they will meet Everton in the FA Cup semi-final at Wembley on 23 April. 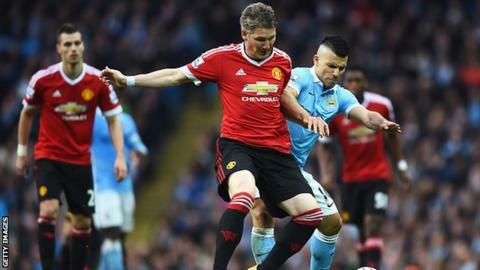 Schweinsteiger, an eight-time Bundesliga winner with Bayern Munich, has made 31 appearances in total for United, his last coming in the 1-0 derby win at Manchester City on 20 March. "I don't think Schweinsteiger shall play this season," added Van Gaal, whose team is fifth in the Premier League table, 19 points behind leaders Leicester City. However, Schweinsteiger could be fit in time to be included in Germany's squad for Euro 2016 in France this summer. "Maybe he is prepared for the European Championship, I cannot predict," added the former Netherlands boss. "It is possible, but then that is also in our favour because then he is fit for the new competition."